We are sure if you are already here, reading the articles carefully, you must be really confused of choosing the best product comes from Sole. There are Sole E35 and Sole E55 that most of users compared them because of the similarities and also the differences. We provide you with the complete one through this article. Enjoy Sole E35 vs Sole E55. 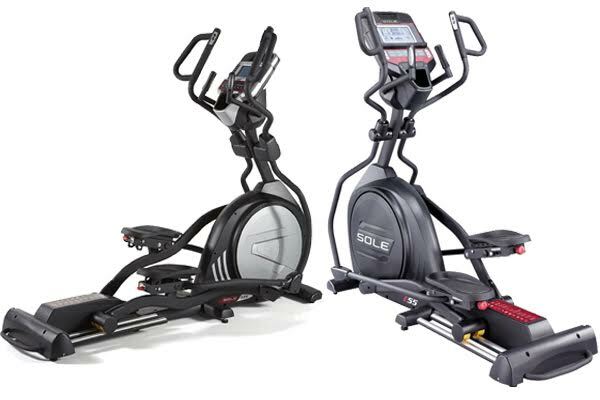 The Sole E55 is featured with smooth elliptical motion and with 20 inch stride length. It is a perfect treadmill for average to above average height individuals. When you get on an elliptical with a smaller stride length you feel constrained and the motion is bouncy. To get the most reward out of your workout you want a comfortable stride. When it comes to the stride, the Sole E55 feels like a Precor elliptical. To further add to the comfort, the foot pedals are adjustable. It also has dual wheels that ride on a beveled rail that produce smooth and stable feel. Comes with Bluetooth capability, you can track your workout stats on the free Sole Fitness app and also comes with a power incline feature, allowing you to raise or lower the elliptical motion and better target and tone your lower muscles. Other features worth noting are wireless heart rate control, speakers, and built-in fan. It is also equipped with adjustable articulating foot pedals. You can adjust to the exact level for your comfort. The console inside will tilt so you can view at an appropriate angle for your height. There are always similarities instead of differences. Between Sole E35 and Sole E55 share the same stride length, the same number of resistance levels, the same sized console, the same number of standard programs, and the list goes on. They are only being separated by the features offered by each treadmill. You’ll find heart rate control programs on the Sole E55 that you won’t on the Sole E35. These programs are extremely for a segment of the population that knows the benefits of working in their optimal heart rate zone.